Google+ Mom to 2 Posh Lil Divas: 10 Ways to Learn Sight Words Through Play! 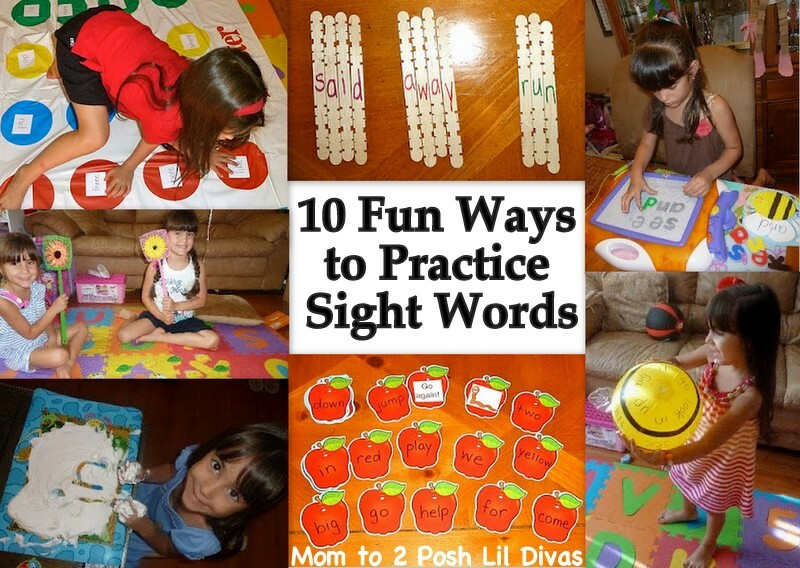 10 Ways to Learn Sight Words Through Play! With the Oldest Diva in Kindergarten, learning to read is a big focus in our home. Along with books and lots of time spent reading (aka practicing) comes learning phonics and sight words. 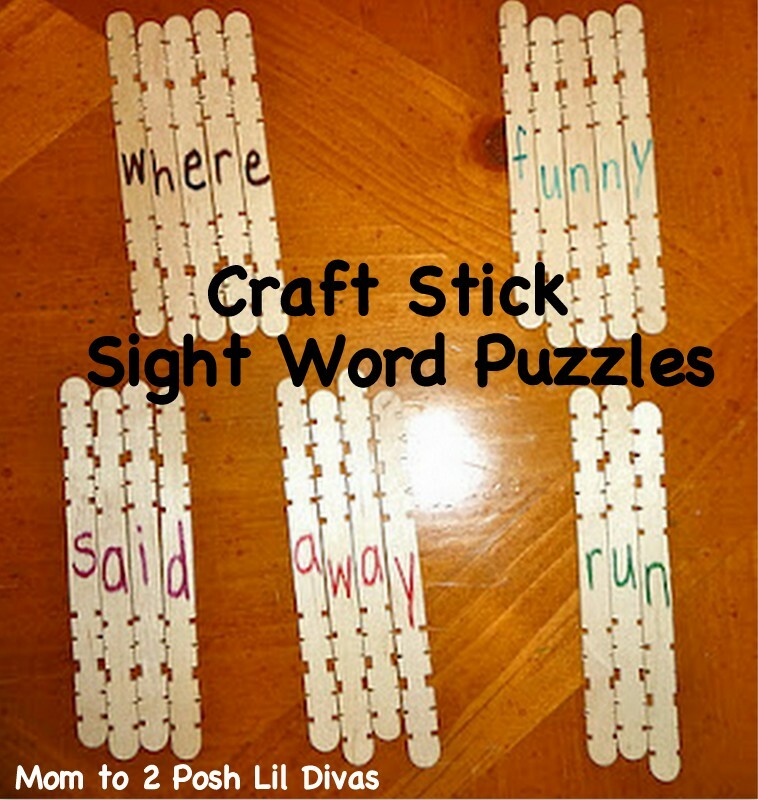 Over the past few months I have shared some of the fun games, activities and materials I have used to help the Oldest Diva learn her target sight words. Today, I am bringing the best of these ideas to you all in one post! I hope you are ready for some Sight Word Fun?! This has to be the most fun we had reviewing sight words! Kids will be begging you to practice sight words this way. These are basically like playing "I Spy" in a bottle with sight words. & put them together like puzzles. What kid doesn't enjoy jumping on the furniture? 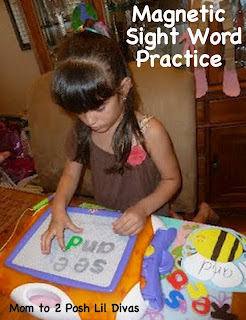 practice their sight words at the same time. 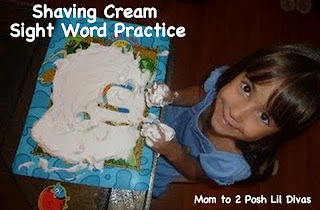 Practice spelling sight words in shaving cream. 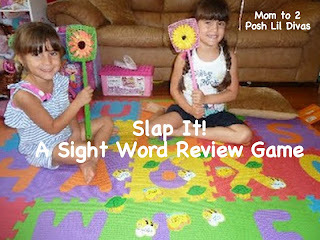 to slap the sight words! FUN! to play Catch the Sight Word. or any other fun materials you have on hand. Magnetic letters on a magnetic board = FUN! Go ahead and practice those sight words on it too. This is another one you can play so many different ways. 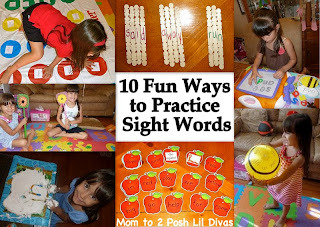 Do you have fun ways to learn sight words and/or spelling words? these are great! my 4 year old has started really getting into reading so we started our first sight words yesterday! Zaira have fun with it - it really helps! Definitely will have to buy/make a twister board-- that looks too fun!! 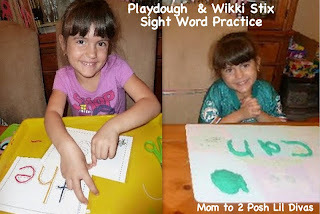 I just posted a Sight Word acitivity @ my blog: http://schooltimesnippets.blogspot.com/2012/03/eat-your-sight-words.html Would love for you to check it out if you have time! yes of course! Repin away! Thank you! Love these ideas....my five year old has just started to read AND her favorite game is TWISTER.....we'll be making this on Spring Break next week and inviting her friends over for playdates!!!! Thanks for the fun ideas! I see fun (learning infused) Twister playdates in your future! Enjoy! 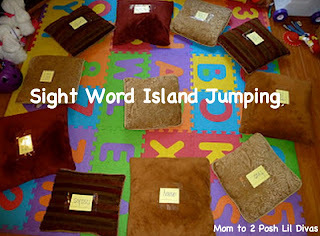 These are great..... My daughter and I play a game on the trampoline with sight words. We will jump as we spell out each letter then bounce on our bottooms as we say the word. Then it is the next person's turn. If she spells something wrong I will let her know the right way to spell it and she gets to go again. We end up laughing so hard and having a great time... Get to exercise our brains and bodies at the same time! We have been doing the words from memory but U was thinking about making a bag with the words written on foam shapes so we could draw the word you get to spell. What a FUN way to practice spelling! Love it! Thanks so much for sharing. Great ideas and easy to accomplish! Never saw popsicle stick puzzles! Love it! I'm making some right now. Sharing on FB and twitter! Such great ideas! 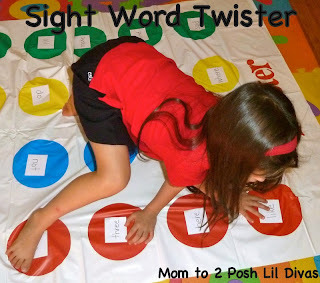 Sight word Twister would be a huge hit in our house! 2. What's the password? Have the ones you are working on, or struggling with, written on cards on a ring. To leave the house, or enter a room they have to "read the password". This can get mundane, so use sparingly! 4. Sidewalk chalk hopscotch - write the words in a hopscotch grid, and read as you hop! Oh, I know what I'll be saving my Sunday paper for! :) Great idea & can't wait to give it a try. I especially like that it can work for both girls. Fabulous! We LOVE the outdoor games (it's part of an upcoming post) there's just something about playing outside that makes learning sight words so much more fun! Great ideas! Thanks for linking up to the Afterschool Blog Hop! 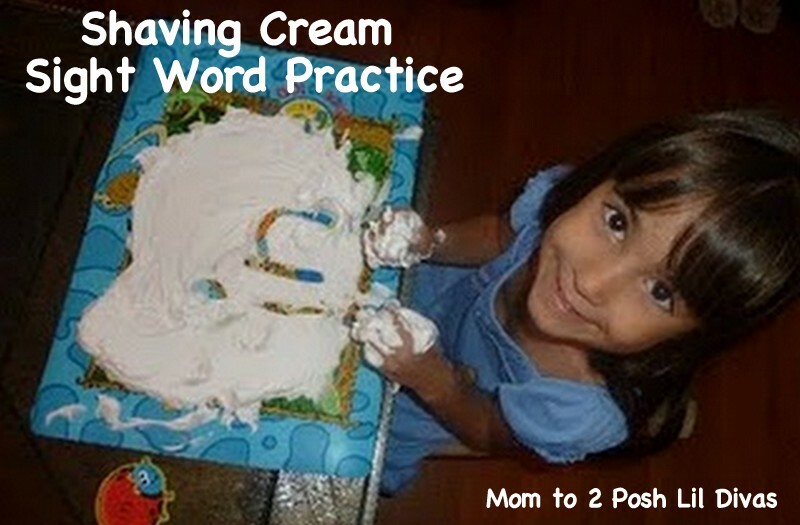 The smile on the shaving cream sight word photo says it all. Thanks for sharing at the Weekly Kids' Co-op. Great post!! 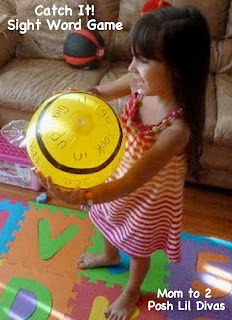 Love the idea of the fly swatters game :) Thanks for linking up to Sharing Saturday. that is my youngest Diva's favorite game! She gets a bit swat crazy! Fun! These are such cute ideas! I was just looking into expending my ways of teaching the kids sight words! Thank you!!! thank you :) Hope you have fun with some of them. I love these ideas. Thank you for being here. I will be buying a twister game next time out. In my classroom we use the flyswatters and the kids love it. That always is filled with childrens laughter. I also like the newspaper idea and can't believe I didn't think of it. One idea I might be able to share that the kids have been having fun with is Jenga. I have different levels and color coded so I can let the kids borrow and can quickly give them the set that's best for them. Fabulous ideas. 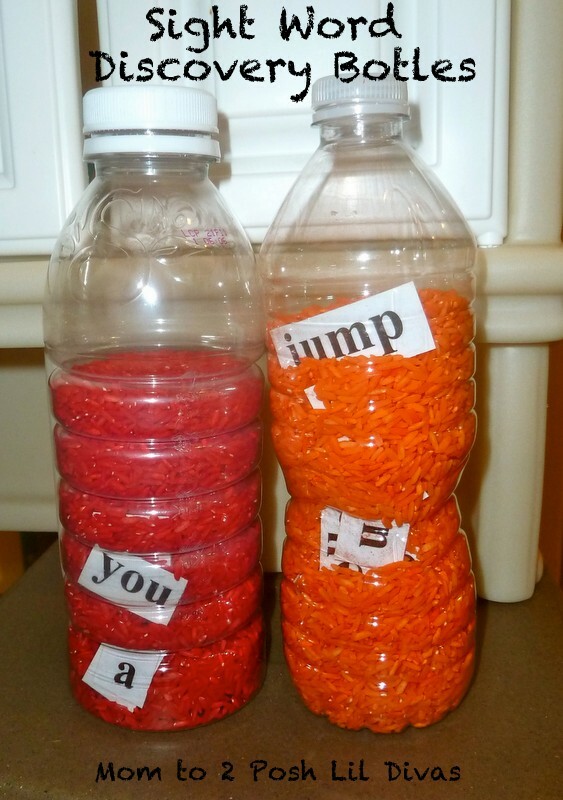 This will make practicing our sight words a blast this summer. Thanks for sharing. I do this with my kids at home:) Use any board game and pieces. You will need dice. Roll the dice, before you can move the game piece you need to read the number of sight words that you rolled. Oooh! my favorite is the craft sticks idea and slap it. I like craft sticks since it also helps with being able to spell out the words. Slap it has always been a favorite of mine. We've even used that idea in my high school spanish class on the projector screen. I just saw fly swatters at the dollar store yesterday. LOVE IT! Love the ideas. 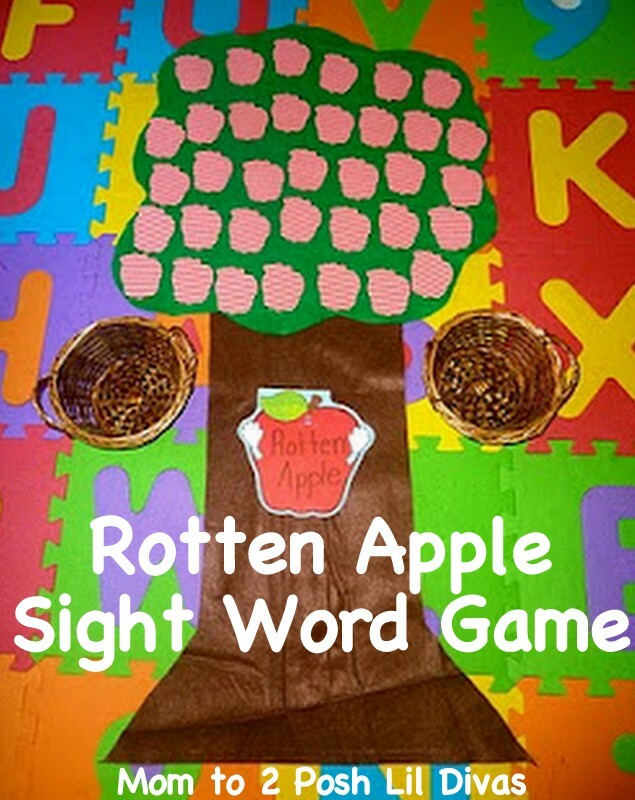 I am always looking for games with sight words for my 4 1/2 year old who is really into learning new words. One of her favorite games is site word hopscotch. We play it outside with chalk but it can be done with tape lines indoors. She throws the rock and has to tell me what word she landed on (if she can)then as she jumps on each word she says the word. We also draw a four by four grid with chalk and fill each box with a different word. Use two different color beanbags (one color for each player), they say the word it lands on and have to try to get four in a row. Outdoor site wrod scavenger hunt is fun. My kids race to find with most words. Some of the words are out in the open and some are a lttle more hidden, they have to say the word to take it and put it in they basket. It also can be hidden in an easter egg. Great ideas. My daughter will love the swat the word game. One of favorite ways to practice sight words is on the light table. I write the word in dry erase marker and then she uses rocks or jewels to trace the word. You should add cup-stacking, and working with Legos/Blocks. I showed my first grader this post and told him he could pick any activity he wanted. He looked carefully and said, "Those girls' mom must be brilliant! She must have a good brain!" Great ideas! As a Kindergarten teacher, it is nice for me to see parents using creative ideas to inspire their children at home. Who wants to use boring flash cards???? Not me, I use some of these games in my classroom. Thanks for sharing with so many others! My daughter's bus stop is 2 blocks from our house. On the way to pick her up I would write her sight words in sidewalk chalk along the way and then she would read them on the way back. Now that she is older I will write out sentences or short stories to work on reading comprehension. She still gets just as excited and it never gets old for her. 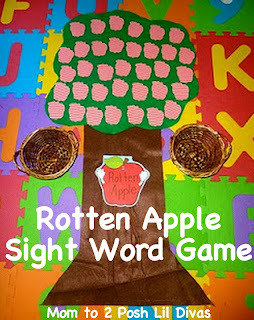 how do you play the sight word game rotten apple? This is a great list. Thanks for posting it. When I'm in a digital kind of frame of mind, I use this simple website www.randomsightword.com to generate a random sight word from the dolch list. Fun, for when we're sitting at a bus stop. Sight word candyland is also a lot of fun. Write sight words on cards and they have to say the wird before they move.